Trains are normally considered a very safe form of transportation, and, compared to cars, they are statistically very safe. The problem is the number of people on one train. One accident can kill or injure dozens of people at a time.A recent Delray Beach area crash shows that. 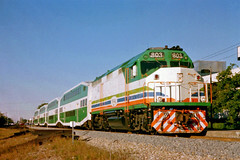 A Tri-Rail train struck a car last Thursday morning, killing the driver of the car and injuring several on the train. The car was crossing the railroad tracks west of Interstate 95 when a northbound Tri-Rail train struck it, demolishing the car and killing the driver. Seven passengers on the train were injured, and the train was carrying 90 people. With the train out of commission and the track closed, Tri-Rail arranged for a bus to carry the passengers on to the next station. Linton Boulevard was closed in both directions between Congress Avenue and Interstate 95 for several hours, although the investigation is not yet closed regarding the cause of the accident. If you’ve been in involved in a car accident recently, perhaps one involving a train or some other form of public transportation, you may be shocked to see the bills such an accident can incur, from hospital and ambulance bills to repair charges and time missed from work while injured. In such a case, you’ll need expert legal representation to help you get the compensation you need and deserve. In such a case, call Miami Car Accident Lawyers for free information about how a skilled accident attorney can help you and fight for you rights in court, if such is needed. Contact us today.